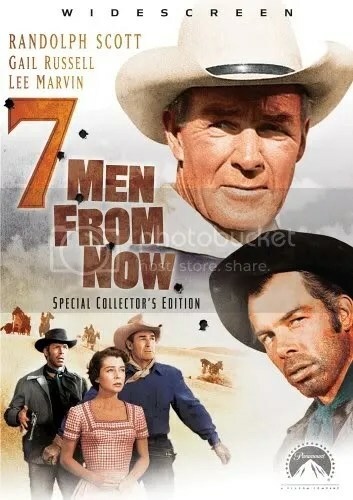 7 MEN FROM NOW is the kind of movie that my mother likes to call “a good ol’ fashioned western” and it’s easy to see why. First off, it’s got Randolph Scott starring in it and if there’s a Holy Trinity of Western Icons then Randolph Scott certainly must be in it (just for the record, my candidates for the two other members of that trinity are John Wayne and Clint Eastwood) and it’s a lean, bare bones movie that tells a highly suspenseful and compelling story in 78 minutes. Despite the short running time, the movie never feels rushed and there’s an amazing amount of characterization and psychological depth. It doesn’t require you to invest a lot of time in it. It tells its story of greed, revenge and redemption without unnecessary padding or wasted scenes and dialog. Ben Strider (Randolph Scott) is a man on a mission. In the town of Silver Springs seven men held up the Wells Fargo office and made off with $20,000 dollars. During the robbery, a female clerk was shot and killed. The clerk was Strider’s wife. His grief over her death is further fueled by his guilt. Strider was the former sheriff of Silver Springs who lost the last election to a younger, savvier man who played politics better than Strider. Strider was offered the job of deputy but his pride wouldn’t allow him to take the job and so his wife had to go to work to make ends meet. 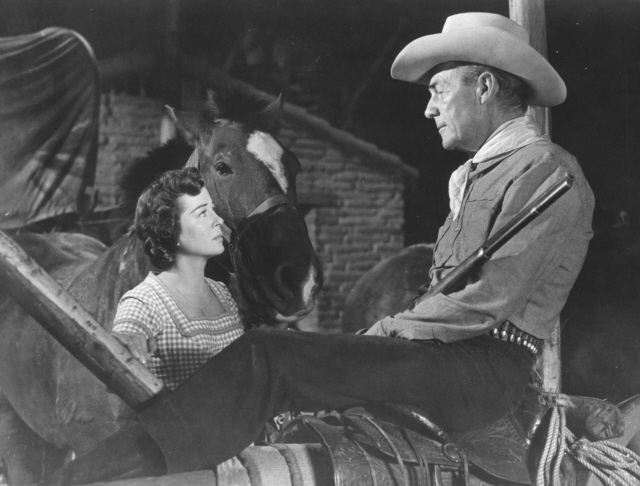 While on the trail of the seven men Strider encounters John Greer (Walter Reed) and his wife Annie (Gail Russell) on their way to a new life in California and they decide to travel together as they’re riding through a dangerous patch of renegade Indian country. They also encounter Bill Masters (Lee Marvin) and his sidekick Clete (Don ‘Red’ Barry) who also ride along but for other reasons. It turns out that Masters knows who robbed the Wells Fargo office and he figures to tag along and let Strider kill the men while he makes off with the loot. He hopes that Strider won’t get in his way but if he does…well, a man’s gotta do what a man’s gotta do in The Old West, right? The situation gets complicated by the obvious mutual attraction Strider and Annie have for each other, an attraction the quick witted Masters picks up on and uses for his own ends. And the seemingly meek John Greer is hiding a dangerous secret of his own that even his wife knows nothing about but when it’s brought to light changes everything between these characters. Lee Marvin has the best role in the movie and makes the most of it. Bill Masters is a complicated character and for much of the movie you’re never really sure of whose side he’s on. He saves Strider’s life twice during the movie and calls him ‘Sheriff’ even though he has no official authority. Masters cheerfully admits that Strider locked him up twice but the way Marvin delivers the line you get the impression that Masters deserved to get locked up and Strider caught him fair and square. By the time the movie got to the climatic showdown between Strider and Masters there’s real emotional drama due to the time invested in the relationship between the two men. The relationship between Strider and Annie Greer is a little more complicated in that Annie is immediately drawn to the stoic, handsome Strider who bears so much tragedy with a sort of nobility that she’s fascinated by. Certainly Strider is more heroic than her husband who’s a nervous, talkative type who’s totally out of his depth in the savage wilderness. If you’ve never seen a Randolph Scott movie then this is a terrific one to start with. You watch Randolph Scott and you’re seeing the template that Clint Eastwood based his western performances on. Scott is the quintessential western hero: a man of action and few words, a straight shooter with his own rough morality and code of honor that is unshakeable and unbreakable. And for a movie with such a short running time there’s a surprising amount of action: there’s three or four major gunfights, an Indian attack, a suspenseful showdown in a saloon between Masters and the leader of the gang who stole the $20,000 and a couple of scenes between Strider and Annie where you’re really not sure if they’re saying what they think they mean or if they’re saying what you think they mean. So should you see 7 MEN FROM NOW? If you like westerns at all and are a fan of the genre I’d say yes with no reservations at all. It’s not a classic of the genre but it’s a superior example and well worth you time to watch. If you don’t like westerns I’d still say to give it a try. The complex, suspenseful relationships between the characters as well as the great dialog may win you over.